Home » IoT Master » How Certified IoT Security Specialists Ensure a Prosperous IoT World? In a world where devices have such incredible capabilities, sometimes I feel myself good-for-nothing and chide my inability to be as smart as the devices around me. Smart fridges, wireless toasters, connected homes, and driver-less cars. Powered by the internet, these devices have become intelligent; while I am becoming lethargic day by day! The phenomenon of IoT has transformed our lives. And yet we are on a constant quest to devise new possibilities for businesses and consumers. The room for improvement is biggest in this world, almost never-ending. Despite being exceptionally user-friendly, these devices pose a great threat since our life’s data is inside them. Do you realize how dire the consequences can be if these chunks of personal data are misused through cyber attacks? IoT, like all the other formidable technologies, necessitates procuring stringent security measures. Certified Internet of Things security specialists will, thus, be in a great demand in the coming days. The advent of the Smartphone era revolutionized the technology industry. There has since been an ever-increasing dependency and consumer adoption of Smartphone. IoT being closely related has seen a similar kind of proliferation. Today, your Smartphone knows your preferences before they even come to your own mind. Right from going to the movie theatre to buying edibles from the grocery store, your Smartphone is ready with its suggestion which is incredibly spot on. IoT devices such as i-Watch and Fitbits significantly track your health and well-being. They do more talking than you, and also take decisions which perhaps your intimidated heart would have chickened out to pull off. The world has become small in the sense that it is now more connected with smart devices. But this compactness has grave implications—the dependence on sensitive data on the device makes you susceptible to hacking when contemplated on a large scale. Know Why IoT Security Matters? With the transforming impact of IoT in almost every industry sector, smart devices continuously generate Big Data and personal data resulting in significant privacy concerns. One of the major shortcomings of the device manufacturers’ end is prioritizing functionality over security. With limited processing power to accommodate most of the modern security capabilities, the security design of these devices itself is flawed since businesses are motivated by minimum capital investments and rapid time to market to make higher profits. To make things worse, there are very few industry standards guiding manufacturers to provide cybersecurity for the IoT devices. In a widely connected world, digital networks must be able to automatically adapt to the changing dynamics. This also includes examining and approving new devices being connected to the network. Amidst all these efforts, implementing best practices for data security and governance must not be placed on the back burner. The world is replete with knowledge. What one needs is the proper channel and guidance to seek it, and then implement it to make one’s existence more productive. There is an incessant competitive race in the technology sector where professionals strive to surpass every milestone of emerging and disruptive technology, reinforcing their skills with the trends in demand. In such a scenario, gaining expertise in the shortest time possible is not only highly desirable but almost indispensable. One cannot spend precious time in reinventing the wheel! IoT Security training and certification is aimed at transforming professionals into specialists. The dangers of IoT breach are alarming. Since the future belongs to the IoT devices with their proliferation surging rapidly into homes, businesses, and other crucial sectors such as healthcare, aviation, and transportation, certified Internet of Things security specialist will be highly sought-after. With a recognized training and certification in IoT security, you are certain to rise higher, with a sky as the limit of your success. To mitigate the threats posed by the compromise of IoT devices’ security, we require more and more IoT security certified professionals. Cognixia.com a Collabera Learning Solutions Company is a leading training and education provider committed to trained individuals, professionals, and students in most of the emerging technologies—IoT Security training and certification is one of them. Designed and regularly updated by experienced industry experts, our training material and course content elucidates complex concepts into easy, comprehensible language. 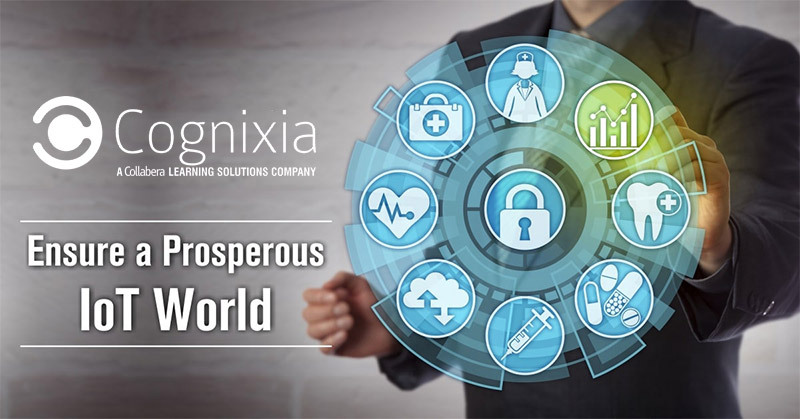 To know more about IoT Security training and certification, get in touch with Cognixia to enrol today and be a part of the esoteric league of specialists committed to ensuring a prosperous, threat-free IoT world.